Frank Bishop has been at war with fallen angels since he was five-years-old. That's when they first tried to kill him. A group of supernatural warriors called the Watchers saved Frank that fateful day. They taught him how to be a powerful wizard and warrior. But nothing could prepare him for what Jessie has done. Jessie was a good girl trapped in a hard life. Just when she thought things couldn’t get worse, they did. And the only way she could save herself was to free Arraziel to help stop the man who was trying to hurt her. But by freeing Arraziel, Jessie has set loose an evil the world has not seen for centuries; an evil that will stop at nothing to rule Heaven and Earth again. A Watcher is dead and Frank has been called in by the Order of Watchers to find the killer. He’ll blur the line between good and evil on his all-consuming quest to stop Jessie and the Fallen before they unleash hell on Earth. 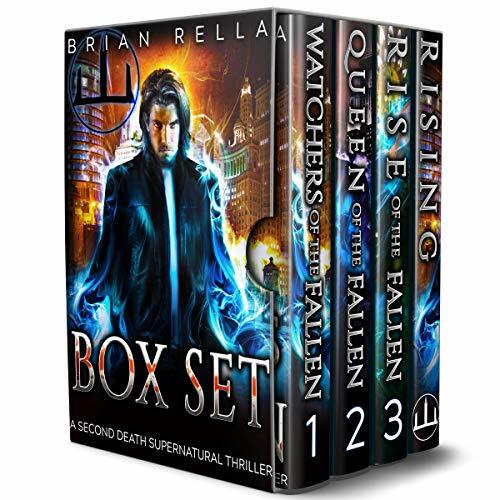 This box set includes the prequel and books 1-3 of the Second Death Supernatural Thriller series. You'll love this series because everyone loves a hero with a dark side. This is a very good deal on a good series. Story was pretty good, dialogue could have been better, definitely had a YA feel. Narration was OK, some of the voices were a little over the top. Having said that, this is a pretty good series and was worth the listen. I've listened to and enjoyed many audio books and have never left a book review, but really needed to tell you guys this is make-into-a-movie good; it's very detailed and fleshed out. A battle between good and evil that escalates and mounts all the way through. We get to develop both sides of this equation throughout the story, and the characters are pretty well fleshed out as the series progresses. The prequel novella lays some basic groundwork, but in the first book, we really get a much better and expanded world-building experience. I personally liked both the antagonist and the protagonist in this story, and kind of rooted for either side every once in a while. I think the narration was pretty solid all throughout, and I really have no complaints. I think Brian Rella does a very good job of making the scale and consequences mount more and more all the way through these books, and the climax has some very interesting payoffs. Definitely worth the credit to get nearly twenty-four hours of content. This box set is more for young adults than adults but is an interesting listen. The story is well written with good character development. Although it starts off with major drama I still found myself listening wondering what will lead to what. The story has a bit more drama than I care for but is also full of action, adventure and the paranormal. The narration was well done and really brought the books to life. This will be a set I'll load on my kids tablets for them to listen to but doubt I'll listen to it again. It's a good story for the young adults in your life. I was not sure at first, but it still kept me wanting to know what happens next. I revolves around a child who disturbed past creates what she became. Frank, who with others fight the good vs, evil battle. It's conclusion is surprising. Overall, we'll done. This audio was given to me free, and I voluntarily gave this review. I really enjoyed these books. The author created a great new world, the story is easy to follow and the characters are likable. Even the main antagonist is a likable person, one that you will feel for more than you will dislike. I like how the magic in people was explained and the mythos the author created to explain it all. The story and the world would have rated a 5 star review but this is Audible and the narrator matters. I just did not like the narrators style, the breaking point was when the author took you back in time to when our main character was a child and the narrator decided to give this small boy a gruff, two pack a day, manly man voice. It was the same voice he used for the adult version which is a gruff, two pack a day manly man, I can understand (in theory) why he choose to do this but it was a bad decision to give a child that voice. When the narrator was not - in character - he read the book somewhat dryly. All in all, I will definitely look for more books in this series but I think I will read them as apposed to listening. I never gave a review that was affected by the narrator before, and I feel bad doing it since the author has no control over this and in the end we are all in it for the stories.